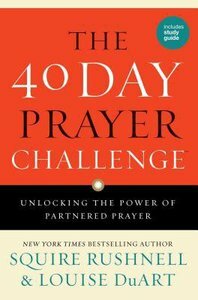 From one of the beloved creators of Schoolhouse Rock and the popular GodWink series, New York Times bestselling author SQuire Rushnell teams up with his wife Louise DuArt for The 40 Day Prayer Challenge-a simple yet powerful idea that encourages partners to pray together for just five minutes a day for forty days. In association with several prominent mega-churches and Baylor University's Institute for the Studies of Religion, SQuire and Louise are initiating the first empirical research study ever done on the effects of prayer among two people over an extended period. The 40 Day Prayer Challenge also provides a no-cost online opportunity to participate in the ongoing study. When the fun and transformational challenge finishes at forty days, prayer partners will receive a scorecard on how well they did, and join others in experiencing the amazing, wonderful things that happen during Partnered Prayer. About "The 40 Day Prayer Challenge"
SQuire Rushnell, a former television president and CEO, was for twenty years an executive with the ABC TelevisionNetwork. Father of such programs for young people as "Schoolhouse Rock" and the ABC Afterschool Specials, he also led "Good Morning America" to the #1 spot. Author of the word-of-mouth phenomenon "When God Winks", SQuire lives in Martha's Vineyard with his wife, Louise.